Just as alchemists transform the ordinary into the extraordinary, with this book you can transform everyday herbs and spices into effective healing herbal remedies. Rosalee de la Foret, a clinical herbalist and education director at LearningHerbs.com, examines the history and modern-day use of 29 herbs, offering clinical studies to support their healing properties. 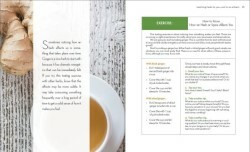 She also dives into the energetics of herbalism, teaching readers how to match the properties of each plant to their unique needs, for a truly personalized approach to health. 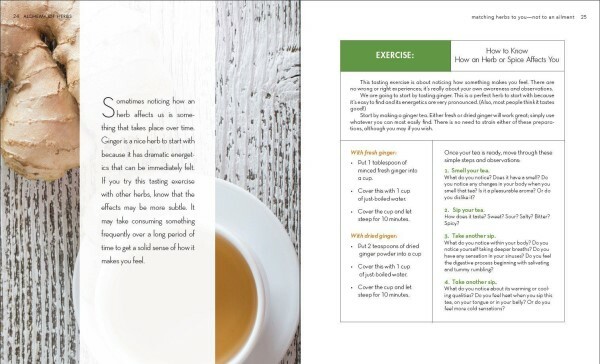 The recipes in this book take a variety of forms-from teas, salves, and pastilles to beauty products and delicious foods-to show how easy it is to incorporate the healing power of herbs into your everyday life. You could start your day with Spiced Cold Brew Coffee, pamper your skin with Green Tea and Rose Facial Cream, make a meal of Astragalus Bone Broth and Sage Chicken, then treat yourself to Cardamom Chocolate Mousse Cake and a Holy Basil-Ginger Julep. 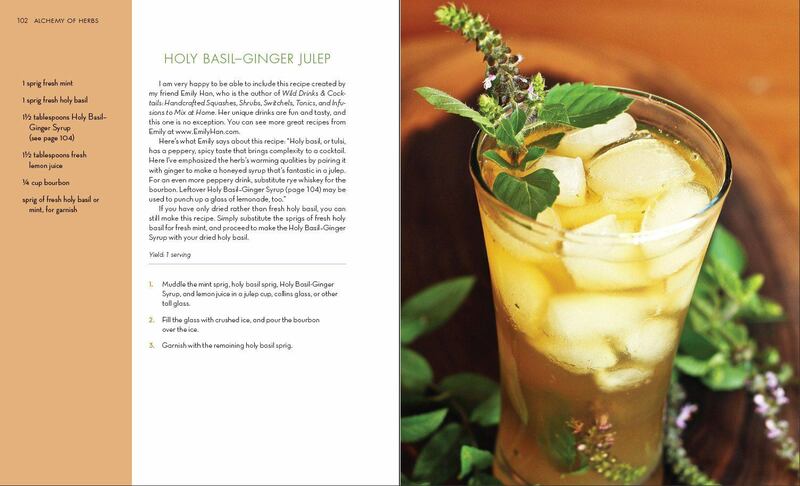 Beautiful photos taken by the author of the herbs and recipes complement each chapter. This book will appeal to those interested in natural health and herbalism, and the recipes offer an easy entry for beginners. Readers will never look at cinnamon, coffee, parsley, lavender, or even chocolate the same way as they realize the kitchen can be their medicine cabinet. Rosalee de la Forêt is passionate about helping people discover the world of herbalism and natural health. She is a Registered Herbalist with the American Herbalists Guild, and as an herbal consultant she helps people find natural solutions to their chronic health problems. She also teaches extensively about herbalism internationally and as the Education Director at LearningHerbs. Rosalee is the author of numerous articles, e-books, and two online courses: The Taste of Herbs and Herbal Cold Care. "In this practical book, Rosalee de la For t reintroduces us to familiar kitchen herbs and spices, helping us to see them in a new light. Through personal and intimate storytelling, she teaches how to match herbs to people effectively instead of using them as pharmaceutical alternatives. Drawn in by the abundant, delicious recipes, you may come to this book as a home chef, but you will leave as an herbalist, transformed by the power of Rosalee's alchemy." "Alchemy of Herbs puts the power of some of the most potent herbal medicines on the planet into your hands. These medicines have been tried and tested for millennia. And now, by combining ancient wisdom with modern scientific understanding, Rosalee de la For t helps you put nature's pharmacy to work. Whether you want more energy, better digestion, deeper sleep, or to get sick less often, Alchemy of Herbs will give you the knowledge you need to restore your health and to contribute to lasting wellness. At once inspirational and deeply practical, this is a book to treasure, and to keep close at hand for the rest of your life." "It's rare to find a writer who can describe complex ideas with such clarity and skill that anyone can grasp their subject--Rosalee de la For t is one of those souls. In this book, she's broken down the energetic qualities and medicinal uses of herbs into an accessible and coherent format. If you've ever struggled with matching herbs to people--the true gift of an herbalist--Rosalee gives you the tools to understand how herbs can effectively 'nudge' the body's leanings back into a state of balance. 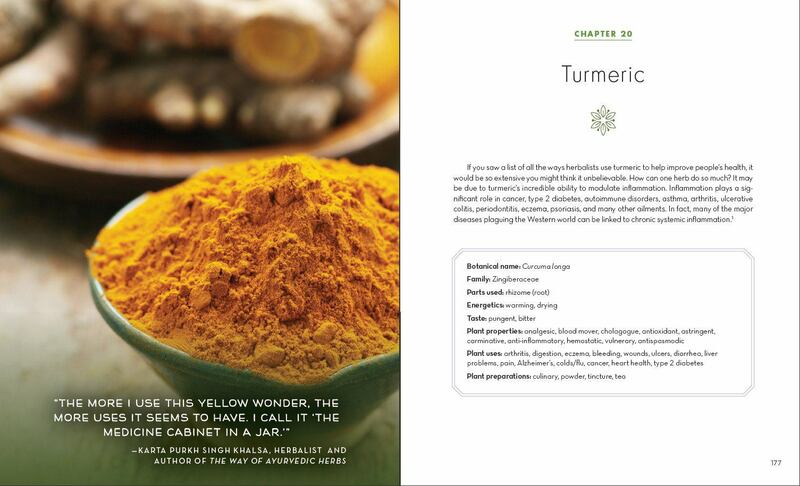 Alchemy of Herbs contains detailed medicinal profiles, zesty recipes, and time-honored plant wisdom. The perfect makings of a top-shelf herbal book that you will treasure for years, and turn to for inspiration time and time again." "This is a wonderfully accessible guide to introducing a medicine chest of healing plants in daily life. The information is presented in a refreshingly approachable way, by an author who loves both herbs and the simple joy they bring into our lives. The abundant recipes show how to access the healing gifts of the herbs as food, created to be both delicious and efficacious. True herbalism!" "Another green blessing of herbal information from a practicing herbalist. What a delight to look at the herbs that Rosalee de la For t loves and to encounter her avid desire to include you in the joy of herbal medicine." "I first met Rosalee de la For t several years ago and was immediately impressed with her knowledge, passion for herbal medicine, and ability to clearly communicate this information. It turns out she is also a very good writer, and it is with great pleasure that I now hold her first book in my hands. Alchemy of Herbs is a wonderful introduction to 29 common herbs and spices, allowing you to understand how to use them safely and effectively for home health care, how to make your own kitchen medicines, and how to make tasty recipes so you can incorporate them into your diet." "So many books geared toward those just beginning to explore the world of medicinal plants offer very basic 'take this herb for that problem' information, under the assumption that the foundational underpinnings of herbalism are somehow 'too hard' for beginners to grasp. Here, in plain English, Rosalee de la For t shows us that the way that herbalists choose herbs for individual people with particular imbalances isn't some magical power or a skill attainable only by those who can devote their lives to intense study. Instead, it is rooted in common sense patterns that anyone can learn to recognize, given a model to do so. That this is done using familiar herbs and spices available to all is an invaluable bonus. A book for everyone." "Herbal medicine can offer so much. But where to start? How do you know what herbs are good for you, and how to separate fact from fiction? Rosalee de la For t presents an excellent approach to learning the rich world of herbs. As an experienced educator and practitioner, she weaves together tradition, experience, and science to present a holistic view of each of the plants, while providing specific and practical advice for how you can bring them into your home and life. Alchemy of Herbs is a treasure for any health-seeker's bookshelf." "Many books introduce readers to herbs and their activities, but Rosalee de la For t skillfully introduces people instead to herbalism--the nuanced art of matching plants to people. Drawing energetic traditions into a modern context and right into our kitchens, she provides a simple and elegant system to look beyond symptoms and generic cures and into the heart of true herbal healing." "Alchemy of Herbs is a must-read for any herbalist, whether fledgling or experienced! Part reference guide, part recipe book, and part herbal, this is a book that every herbalist will reach for again and again. Rosalee de la For t has a knack for teaching others how to use herbs in the best way possible by matching people to herbs. This book is the definitive guide for the subject, giving anyone the confidence to use herbs to their fullest potential. Each chapter is engaging, relaying herbal information through a variety of anecdotal stories, scientific studies, and traditional usage, mixed with a variety of unique and inspiring recipes and gorgeous photographs. This is a book you will want to leave sitting out on your desk, coffee table, and kitchen counter, all at the same time." "Alchemy of Herbs is a sensory wonder, bringing us our medicines in the most delightful and tantalizing way they can be experienced: as culinary medicines. Step away from the bottle and the capsule and experience herbs in the full richness they can offer both as medicines and as partners in a life rich with plants." "As a French herbalist, I have a particular affinity for herbs that are both culinary and medicinal. We have a long tradition of healing food where I live in the South of France, mainly through the incorporation of aromatic herbs in our daily meals. Alchemy of Herbs is what I had been hoping for for years. Rosalee de la For t sends us a very important message: health does not necessarily mean yucky potions. This book brings together beautiful pictures, tasty recipes, and health recommendations from an expert healer. In a nutshell: this an invitation to cooking for a long and healthy life." "Informative, concise, knowledgeable, and generous . . . Rosalee de la For t's sophisticated approach and her personal experience with herbs comes through in her beautiful recipes, which eloquently combine food and herbal medicine. Keep this book on your kitchen shelf--you'll refer to it for healing and inspiration, always!" "In this inspiring and practical book, Rosalee de la For t empowers you to awaken your senses in order to choose the best herbs for your needs. And what better way to experience the benefits and pleasures of herbs and spices than in the kitchen? Whether you're brand-new to herbs or have been using them for years, you'll love these enticing recipes for delicious drinks, everyday meals, and simple remedies." 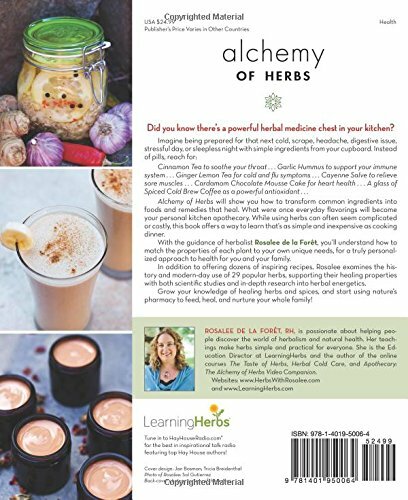 "In Alchemy of Herbs, author Rosalee de la For t joyously shares her deep wisdom of herbs to inspire and empower us to transform our kitchens into nature's apothecary where delicious, healing foods and herbal remedies pour forth. Golden Milk, Hawthorn Cordial, and Nettle Leaf Dukkah are just a sampling of the many tasty, curative recipes offered. She unveils the enchanting, yet readily accessible world of herbalism that makes me fall right back in love with the plant kingdom; and you will too!" "In her wonderfully written book, Alchemy of Herbs, Rosalee de la For t encourages the reader to 'break free from the insanity of the One-Solution Syndrome' by choosing personalized herbal formulations based on what our own senses tell us our bodies need. What better scenario is there for using our senses to divine this knowledge than cooking with flavorful and aromatic healing herbs and spices? Self-empowerment begins in the kitchen as Rosalee tempts us with dozens of mouth-watering recipes and encourages us to 'move forward with the mind-set of an explorer.' Those new to plant-based healing as well as experienced herbalists will find that this beautifully illustrated book exemplifies the heart and soul of herbal healing through delicious food as powerful medicine." "Rosalee de la For t has done a wonderful job of melding both the culinary and medicinal uses of herbs in a way that allows just about anyone to incorporate herbs into their daily lives. 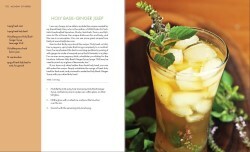 The recipes in Alchemy of Herbs are not only very appealing, but simple enough for the novice cook or herbalist. For those who are looking to spice up their lives and improve their health, I would say that this is the book for you." "Rosalee de la For t has broken down some of the more complex parts of herbal medicine into clear and straightforward pieces. It's very practical, but not at the expense of art and beauty. This book will be a classic." "It's exciting to watch more and more people becoming empowered in taking better care of themselves and their families with the use of herbs and spices. Rosalee de la For t shares concepts like energetics and taste in such a way that makes it easier for people to understand them, and how to find which herbs are best for them as individuals. I'm sure that this book will prove invaluable to those wishing to make that leap into feeling comfortable and confident in making herbs a part of their lives. Everyone will learn something new!" "I highly recommend Rosalee de la For t's lovely collection of personal stories, recipes, and herbal information. Reading it is like working in the kitchen alongside the delightful Rosalee, whose talent and experience with herbs is expert. Her book is unique in that it explains both the chemistry and the energetics of medicinal herbs and at the same time introduces their use in a friendly and inviting way." "Rosalee de la For t's book is an excellent introduction to the energetics and science behind the use of our most common culinary and medicinal herbs, providing the reader with a solid foundation for further learning and exploration." -- Todd Caldecott, Dip. Cl.H., RH(AHG), CAP(NAMA), Ayurvedic practitioner, medical herbalist, and author of Food as Medicine? This is a great book and well written for the health conscious. Informative and useful herbal for good health. I was pleased to add this book to my personal library. The book is a good reference to everyday living. This book has all the knowledge and information I need to learn from. I think it's suited to all levels, beginners to experienced with herbs, and anyone from any age group can use it. Love this book - using it all almost every day. This fantastic book is a great introduction to herbs (though it contains enough information to be of interest to those with more experience too). The recipes are easy, tasty and a great way to include herbs in your every day meals and life. Could not recommend it highly enough. Excellent book. Highly recommend to anyone wanting to incorporate herbs into their life.